February 26, 2011 - no comments. Posted by Larz in packaging. I was looking through my archive of vintage card boxes, looking for ideas for the upcoming Tractor series. While I had them laid out, shot some photos to share. 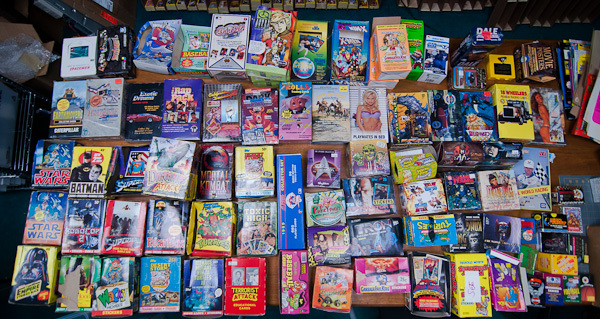 about 1/3 of the boxes above are full with packs from their series. 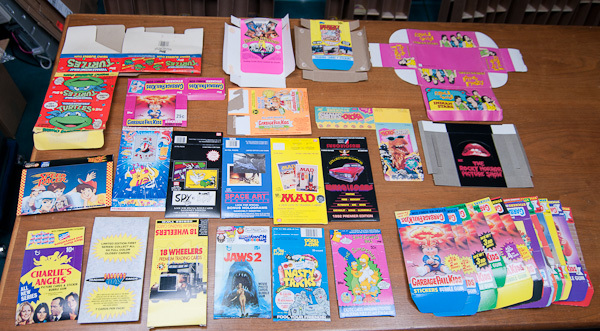 These are all published in the early 90’s by FPG. I am fascinated by the company. They did foil packs, which is a neg, but what I love is that they were completely focused on Fantasy Art. Each series was focused on one artist. I believe they put out about 120 different series, from 1991 to 1995. A trading card dealer at the Philly show told me that a divorce caused the end of the company. I have about 25 full sealed boxes so far, and the complete-ist collector inside me has accepted the challenge to get a full set of every unique box they produced.